Click on a category to view more information of trouble shooting tips and helpful information for fluid power systems. If you need further assistance, please contact us. This is the most important consideration when installing the cylinder. When cylinders are shipped, the ports are usually securely plugged with plastic plugs which should not be removed until the piping is to be installed. All piping should be thoroughly clean, to include the removal of all threading and flaring burrs or chips, before making the connection to the cylinder ports. One chip can cause premature failure of the cylinder or other hydraulic system components. Improper alignment will result in excessive cylinder wear. Check to assure rod alignment between the cylinder and its mating component on your machine in both the extended and retracted positions. Air with the cylinder or system will cause erratic operation of the cylinder. Most cylinders generally do not require bleed ports if the cylinder ports are mounted in an upright position. Several full strokes of the cylinder will purge air from the cylinder into the circuit piping, where it can be bled off. Bleeder ports are available for applications where the cylinder is the high point of the circuit or where the cylinder does not complete a full stroke during its normal cycle. The use of high strength alloy steel mounting bolts 1/16” smaller than the hole size is recommended. After final alignment, foot mounted cylinders should de dowel pinned in place. Lubricated pillow blocks designed for close tolerance applications should be used. It is important to rigidly mount and align the pillow blocks so that the trunnion pins will not be subjected to any extreme bending moments. The rod end should be pivoted with the pivot pin in line and parallel to the axis of the trunnion pins. The use of high strength alloy steel mounting bolts is recommended. Shear keys should be used to reduce the stress on the mounting bolts created by the normal push and pull forces created by the cylinder cycle. The controlled diameter rod busing extension can be used as a pilot to locate the flange mount. Dowel pins should be used after the cylinder is mounted and aligned to prevent shifting. This type of cylinder must be pivoted at both ends and the pins must be in line and parallel to each other. After the cylinder is mounted, the customer should check to assure that the cylinder is free to swing through its working arc without interference from other machined parts. When changing rod seals, extend the piston rod 3” or more if possible, being sure to support the rod at all times. Remove the retainer plate screws (if tie-rod nuts have to be removed, refer to the nut torque specification on this page when reassembling the cylinder), retainer plate and outer bushing. Using an eye hook or thin screwdriver, pry the vees from the end cap cavity (if low pressure air is applied to the rod end port, this will help to force the vees from the cavity). The new set of vees should be assembled into the cavity separately and lubed with soft vee in the center. Replace the rod wiper in the busing and reassemble the cylinder. When changing piston seals, extend the piston rod 3” or more if possible, being sure to support the piston rod and the piston at all times. *Remove the tie-rod nuts, blind end cap, the barrel and the piston seals. A light grease, compatible with the system fluid, grease, compatible with the system fluid, should be used on the rings and block vee seals for smooth assembly. Install the block vee piston seals, scarf cutting on only the back-up washers. Then install the cast iron rings with the joints in opposite directions. To reassemble start the piston into the tube, compressing the cast iron rings using twine or a ring compressor. When the piston block vee seal is to the edge of the barrel, use a thing rounded blade to start the lip of the block vee, making sure the entire lip is started before moving the piston further into the tube. *Note: When a cylinder has been disassembled this far, the barrel seals should at least be inspected, if not replaced. When replacing barrel seals, use the same method of disassembling the cylinder as used when replacing piston seals. The barrel seal consists of a backup washer and O-Ring, which is assembled on the first step of both ends of the tube, with the backup washer going on first. The outer diameter of the tube groove on the end caps must be checked for nicks or burrs and then greased. Position the end caps squarely on the tube (check to make sure port location is correct) and firmly force or tap the end cap over the tube until it bottoms. Check to make sure the O-Ring did not shear and then finish assembling the cylinder. Often times, cylinders are delivered before a customer is prepared to install them and must be store for a period of time. Select and area indoors for storage, which has dry and non-corrosion atmosphere. Take caution to protect the cylinder from both internal and external corrosion. Cylinders to be stored should be kept in a vertical position (piston rod up) whenever possible. Port protector plugs should be kept in the cylinder ports until the time of installation. External leakage: If leaking occurs between the end cap and barrel, check tie-rod torque. Do not over torque. If the torque is correct, then replace the barrel seal. When leakage occurs in the rod busing area, replace the rod seals. If leakage continues or reoccurs in short period of operation, check the head end cap, cap end cap and rod bushing. Cylinder misalignment: Side load is a common problem which occurs when the cylinder application does not allow the piston rod to work in line during the extend and retract motions of the cylinder. Evidence of this is excessive seal failure, bushing wear or galling of the piston rod. Often, bending of the piston rod or complete failure (breakage) of the rod occurs. Contamination on the piston rod: Dirt and other material is often picked up when the piston rod is extended. When the rod is retracted in an excessive dirty application, it often carries the dirt back into the rod seal cavity of the cylinder, causing damage to seals. With a slight modification of the cylinder rod end, a rod boot can be added to protect the rod busing and seals for most applications. Bad mountings: Due to wear of pivot pins or mounting bolts working loose, a cylinder may have side load, even though the rod was in line when the cylinder was first installed. All cylinder mountings should be checked periodically. Damaged piston rod: An extended piston rod can be damaged by the impact of a hard object which could burr the rod. If this occurs, the rod should be checked immediately to prevent seal damage. Internal leakage: Inside the cylinder, leakage past the piston seals can cause sluggish movement or settling of the cylinder under load conditions. This occurs due to leakage of worn piston seals or rings. Creeping cylinder: When a cylinder is stopped in midstroke and it creeps, check for internal leakage. Creeping can also be caused by a worn control valve and this should be checked, even if the cylinder is found to have internal leakage. Erratic operation: When a cylinder is erratic or sluggish in operation, this may be caused by a number of problems. The most common cause of sluggish operation is air in the system. Internal leakage could also be a cause. If the system starts out sluggishly and, as it warms, speeds up, the oil may be of too high viscosity. The whole system should be checked for worn components if after these checks, the cylinder is still operating in a sluggish manner. A hydraulic pump produces flow. Flow is the amount of fluid coming out of the pump. Pressure occurs when there is resistance to flow. Pressure applied at any point upon a confined liquid is transmitted undiminished in all directions (Fig.1). This means that when more than one hydraulic cylinder is being used, each cylinder will pull or push at its own rate, depending on the force required to move the load at that point (Fig. 2). Cylinders with the lightest load will move first and cylinders with the heaviest load will move last (Load A), if the cylinders have the same capacity. To have all cylinders operate uniformly so that the load is being pulled or pushed at the same rate at each point, control valves (see Valve section) must be added to the system (Load B). The amount of force a hydraulic cylinder can generate is equal to the hydraulic pressure times the “effective area” of the cylinder (see cylinder selection charts). Use the formula F = P x A to determine either force, pressure or effective area if two of the variables are known. The volume of oil required for a cylinder (cylinder oil capacity) is equal to the effective area of the cylinder times the stroke. The amount of hydraulic oil in the pump’s reservoir which can be used to activate one or more cylinders. Pressure applied at any point Cylinder speed is determined by dividing the pump flow rate by the cylinder effective area. Various seal types are used in our hydraulic equipment: O-rings, U-cups, Quad-rings and T-rings for static and dynamic applications such as rod-seal, piston-seal and wipers. Buna-N (nitrile rubber) and Polyurethane basic compounds are most frequently used – they offer the best performance and durability for most applications. Heat is a crucial factor in seal life. Maximum temperature for good seal life is 150°F (65°C). This is also the maximum temperature of Enerpac hydraulic oil. Above 150°F, the use of Viton and high temperature oil is necessary. Viton has a maximum temperature which is much higher than nitrate or polyurethane. Viton is however an extremely quick wearing material. In many cases Viton seals will have a short working life due to abrasive wear. Not all machine tool coolants are compatible with standard Enerpac seals. While most are, there are coolants that can harden or soften seals, which may result in free entry of contamination into the hydraulic cylinder. Using a high water based coolant may cause severe corrosive damage. This will often occur on fixtures where coolant has been allowed to pool for an extended period of time and evaporation has allowed it to concentrate. Drain and clean fixtures after use. Often Viton seals are an immediate cure for coolant attack on standard Enerpac seals. When using Viton seals in cylinders, seals in the power source must also be replaced by Viton because inevitably some coolant will enter the hydraulic system. Consult the coolant manufacturer to verify compatibility with any seal material. Cutting fluid suppliers will provide an application book on the compatibility of their fluids. If problems arise after previous successful use, or if problems persist, contact Enerpac. Hydraulic clamping can increase your machine shop’s efficiency by reducing setup time. Power clamping can also maximize output by reducing employee lost time due to the injuries that can occur with manual clamping. Although hydraulic operation moves the control of the clamping fixture to an area of greater safety, operators must still be alert to several common sense practices. And to that end we offer some DOs and DON’Ts, simple common sense points which apply to all Enerpac hydraulic products. The line drawings and application photos of Enerpac products throughout this catalog are used to portray how some of our customers have used hydraulics in industry. In designing similar systems, care must be taken to select the proper components that provide safe operation and fit your needs. Check to see if all safety measures have been taken to avoid the risk of injury and property damage from your application or system. Enerpac cannot be held responsible for damage or injury, caused by unsafe use, maintenance or application of its products. Please contact the Enerpac office or a representative for guidance when you are in doubt as to the proper safety precautions to be taken in designing and setting up your particular system. Directional control valves Ways – the (oil) ports on a valve. A 3-way valve has 3 ports: pressure (P), tank (T), and cylinder (A).A 4-way valve has 4 ports: pressure (P), tank (T), advance (A) and retract (B). Single-acting cylinders require at least a 3-way valve, and can, under certain instances, be operated with a 4-way valve. Double-acting cylinders require a 4-way valve, providing control of the flow to each cylinder port. 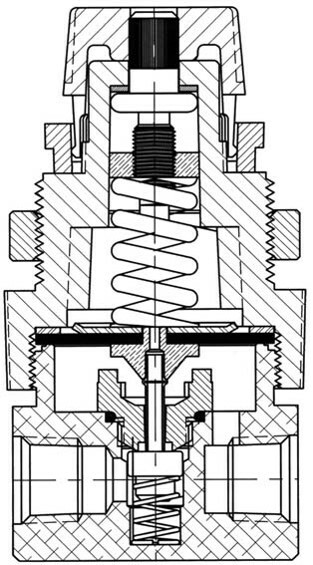 Positions – the number of control points a valve can provide A 2-position valve has the ability to control only the advance or retraction of the cylinder. To be able to control the cylinder with a hold position, the valve requires a third position. 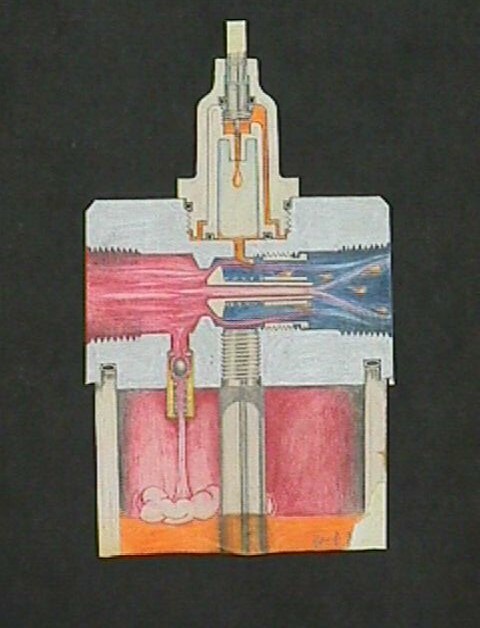 Operation – the way to shift the valve into position. The valve position can be manually operated with the use of the handle. The valve position can be solenoid operated using power supply. The center position of a valve is the position at which there is no movement required of the hydraulic component, whether a tool or cylinder. The most common is the Tandem Center. This configuration provides for no movement of the cylinder and the unloading of the pump. This provides for minimum heat build-up. The next most common is the Closed Center configuration, which is used mostly for independent control of multi-cylinder applications. This configuration again provides for no movement of the cylinder, but also dead-heads the pump, isolating it from the circuit. The use of this type of valve requires some means of unloading the pump to prevent heat build-up. Another commonly used valve configuration is Float Center. This type of valve allows the cylinder ports to drain pressure back to tank. Used with a pallet mounted pilot operated check, it allows the hydraulics to be disconnected from the pallet. The direction of the oil flow can be controlled depending on valve type, valve positions and port functions. The most common type of pressure control valve is the pressure relief valve. This valve is used to limit the maximum pressure in the hydraulic circuit. This valve should always be included in any hydraulic system to limit the circuit to a maximum safe pressure. When used in a system, design considerations should be made since the valve does not act instantly. As the pressure approaches the set point the valve will at first only permit a very small amount of oil to pass. It is only when the valve opens farther that the full flow will pass through the valve. From a practical standpoint, don’t set the relief valve with a hand pump and then use it with a power pump and vice versa. The point of operation will vary. Also because of this action, when used in application with a pressure switch, the pressure setting on the pressure switch should be set at least 500 psi (35 bar) lower than the point at which the relief valve opens. This will prevent rapid cycling of the motor on the pump because of the slight pressure loss thorough the relief valve. If the pressure settings must be closer than that the pressure switch should be monitoring the system pressure and a check valve should be added between the pump and the system. This will permit the pressure to bleed down on the pump through the relief and yet the check holds the pressure in the system, which is monitored by the pressure switch. This valve controls the order in which various branches of the hydraulic circuit operate. It sequences the order of the actions. In practice, one part of the circuit will reach a preset pressure at which point the sequence valve will open and permit oil to flow to the secondary part of the circuit. When the flow to the secondary part of the circuit begins, the pressure in the first part of the circuit will remain at the set point permitting for example a work support to stay at its rated pressure as the swing cylinder clamps. Everyone in maintenance encounters hose failures. Normally, the hose is replaced and the equipment goes back on line. Occasionally, however, the failures come too frequently – the same problems keep popping up. At this point, it is the task of maintenance to determine and correct the cause of these repeated failures. Failure to look into the problem, it the fault lies with the hose, will result in not only the repeated loss of hose lines, but may also cause unacceptable unscheduled downtime. If the problem lies with the equipment, failure to determine the cause could eventually result in the loss of the equipment. A little effort in the beginning can help you avoid a big headache in the long run. Every failure should be analyzed, even if that analysis is as basic as deciding that the failure was normal and acceptable. However, if the failure rate is unacceptable, you should probe a little deeper to determine the cause of the failure and to correct the problem. Beginning with a common cause of hose failure – improper application – compare the hose specifications with the requirements of the application. Check all of these areas against the requirements of the application. If they don’t match up, you need to select another hose. It’s a good idea, at this point, to call on your local hose distributor for assistance in selecting the proper hose. Aeroquip distributors are well equipped to perform this service for you. Distributor personnel attend special Aeroquip sponsored training courses in hydraulics and hose applications. Or, if your problem is particularly difficult, the distributor can call on the services of Aeroquip’s Field Engineering staff. Send in a sample of the hose or provide the par number and date of manufacture. This information is supplied on the layline of the hose. For example, FC195-08, 1Q88 is Aeroquip FC195, ½-inch hose manufacture in the first quarter of 1988. Mention the type of equipment on which the hose is used and the location of the hose on the equipment. rovide the brand name and number of the fluid carried by the hose. Give the maximum and minimum temperatures, both internal and external, of the system in which the hose operates. Remember that temperatures can vary widely from one part of your equipment to another. Try to get a reading as close to the failed hose as possible. If the hose is bent, give the size of the bend radius along the inside of the curve, or send along a tracing of the curve on a piece of paper. If the hose flexes, say so. Give the maximum volumetric (gpm) glow through the hose (not always the same as the pump gpm as in cylinder circuits). List the maximum pressures, both static and surge, to which the hose is subjected. Describe the environment in which the hose operates. By providing the distributor or manufacturer with complete information, you will get a better and quicker answer to your problem. Other major causes of premature hose failure are improper assembly and installation procedures, involving anything from using the wrong fitting on a hose, to poor routing of the hose. Aeroquip provides excellent training material that offers assistance in combatting this problem. A little time spent in training could pay big dividends in reduced downtime. By making use of the free materials available from Aeroquip, you can improve your hose assembly and installation techniques. Contact Aeroquip or a distributor for details. 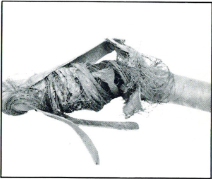 A crushed hose is an example of external damage. However, the hose may also be abraded and / or corroded. These are problems that can normally be solved once the cause is identified. The hose can be rerouted, clamped or an abrasion guard can be used. In the case of corrosion, the answer may be as simple as changing to a hose with a more corrosion resistant cover, or rerouting the hose to avoid the corrosive element. Frequent or premature hose failure can be the symptom of a malfunction in you equipment. This is a factor that should be considered since prompt corrective action can sometimes avoid serious and costly equipment breakdown. Occasionally, a failure problem will lie in the hose itself. A likely cause of a faulty hose is old age. Check the layline on the hose to determine the date of manufacture. The hose may have exceeded its useful life. If you suspect that the problem lies in the manufacture of the hose and you don’t jump to this conclusion until you have exhausted the other possibilities) contact your supplier. With modern quality control procedures, the odds of a faulty batch of hose being released for sale are extremely small. So make sure you haven’t overlooked some other problem. 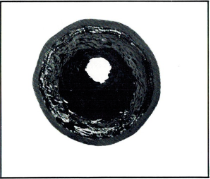 A physical examination of the failed hose can often offer a clue to the cause of the failure. The following list suggests 23 symptoms to look for and the condition that could cause them. Symptom: The hose tube is very hard and has cracked. Cause: Heat will leach the plasticizers out of the tube. Plasticizers give the hose its flexibility. Aerated oil causes oxidation to occur. This reaction of oxygen on a rubber product will cause it to harden. Any combination of oxygen and heat will greatly accelerated the hardening of the tube. Cavitation would have a similar effect. Symptom: The hose is cracked both externally and internally, but the elastomeric materials are soft and flexible at room temperature. Cause: The probable reason is intense cold conditions while the hose was flexed. Most standard hoses are rated to -40°F (-40°C). 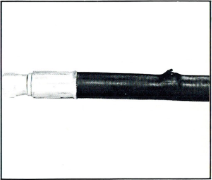 Military specified hoses may be rated to -65°F (-54°C). Many Teflon™ hoses are rated to -100°F (-73°C). Symptom: The hose has burst and an examination of the wire reinforcement, after stripping back the outer cover, reveals random broken wires running the entire length of the hose. Cause: This could indicate a high frequency pressure impulse condition. The SAE impulse test requirement for double wire braid reinforcement (SAE 100R2) is 200,000 cycles at 133% of maximum operating pressure. The SAE impulse test requirement for a four spiral wrapped reinforcement (SAE 100R12) is 500,000 cycles at 133% of maximum operating pressure. If the extrapolated impulses in a system amount to over a million in a relatively short time, a spiral reinforced hose would be the better choice. Symptom: The hose has burst, but there is no indication of multiple broken wires the entire length of the hose. Cause: This could indicate that the pressure has exceeded the minimum burst strength of the hose. Either a stronger hose is needed or the hydraulic circuit has a malfunction, which is causing unusual high pressure conditions. Symptom: Hose has burst. An examination indicates that the wire reinforcement is rusted and the cover has been cut, abraded or deteriorated badly. Once the cover protection is gone, the reinforcement is susceptible to attack from moisture or other corrosive matter. Symptom: Hose has burst on the outside bend and appears to be elliptical in the bent section. Or in the case of a pump inlet (suction) line, the pump is noisy and very hot. The pressure line from the pump is hard and brittle. Cause: Violation of the minimum bend radius is most likely the problem in both cases. Check the minimum bend radius and make sure that the application is within specifications. Note: it is permissible to lower the minimum bend radius when the pressure is reduced. Check with your supplier. In the case of the pump inlet line, partial collapse of the hose may cause the pump to cavitate, creating both noise and heat. This is a very serious situation and may result in pump failure if not corrected. Symptom: Hose appears to be flattened out in one or two areas and is kinked / twisted. Cause: Torqueing of a hydraulic control hose will tear loose the reinforcing layers, and allow the hose to leak through the enlarged gaps between the braided plaits of wire strands. Be sure there is never any twisting force on a hydraulic hose. Symptom: Hose tube has broken loose from the reinforcement and has collapsed the I.D. of the hose. In some cases, the tube may protrude into the hose fitting. Cause: A probable cause is high vacuum or the wrong hose for vacuum service. Vacuum is not recommended for any hose that does not have a full fabric braid over the tube unless some sort of internal support coil is used. Even though a hose is rated for vacuum service, if it kinked, flattened out, twisted or bent too sharply, this type of failure may occur. Symptom: Hose has burst about six to eight inches away from the end fitting. The wire reinforcement is rusted. There are no cuts or abrasions of the cover. Cause: Improper assembly of the hose and fitting can allow moisture to enter around the socket. The moisture may “wick” through the reinforcement. The heat generated by the system may drive it out from around the fitting area. But, six to eight inches away, it will be entrapped between the tube and cover causing severe rusting or the wire reinforcement. Symptom: There are blisters in the cover of the hose. These blisters contain oil. Cause: A minute pin hole in the tube is allowing the high pressure oil to seep between it and the cover. Eventually the oil will form a blister wherever the cover adhesion is weakest. This could be caused by either a faulty tube or incorrect assembly of the fitting. Symptom: Blistering of the cover where a gaseous fluid is being use. Cause: High pressure gas (above 250 psi) is effusing through the pores of the tube, gathering under the rubber cover and eventually forming a blister wherever the adhesion is weakest. Specially constructed hose with a perforated rubber cover is available for high pressure gaseous applications. Your supplier can advise you on the proper hose to use to use in this situation. Symptom: Hose blew out of the hose fitting. Using the incorrect fitting on the hose, such as a tube size fitting on a full bore hose, a non-skive fitting on a skive hose or a hose and a fitting designed by different manufacturers. Incorrect assembly procedures due to insufficient or incorrect lubrication, improper positioning of the fitting on a hose or incorrect selection of crimp and swage dies. A crimped or swaged fitting must be properly positioned on the hose for correct assembly; always mark the fitting position before crimping or swaging the fitting. Incorrect hose length. (Often an assembly is too short to allow for proper operation under pressure. Cause: indications are that the tube is not compatible with the fluid being conveyed. Even though the fluid is normally compatible, the addition of heat can be the catalyst that can cause tube deterioration. Consult your hose supplier for a compatibility list or present him with a sample of the fluid being conveyed for analysis. Make sure that the operating temperatures, both internal and external, do not exceed the recommendations of the fluid or hose manufacturer. Symptom: Hose has burst. The hose cover is badly deteriorated and the surface is crazed. Symptom: Hose is leaking at the fitting because of a crack in the steel tube, adjacent to the braze on a split flange shoulder. 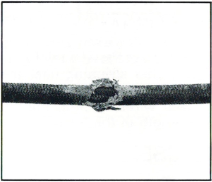 Cause: Because of the crack is adjacent to the braze and not in the braze, this is a stress failure that could be brought on by a hose that is trying to shorten under pressure, but has insufficient length to do so. Aeroquip has cured dozens of these problems by lengthening the hose assembly or changing the routing to relieve the forces on the fitting. Symptom: A spiral reinforced hose has burst and literally split open. The wire is exploded and badly entangled. Cause: This hose may have been too short to accommodate the change in length occurring while it was pressurized. Cause: The hose has been kinked or twisted either by bending it too sharply or by squashing it in some way so that a major restriction was created. As the velocity of the fluid increases through the restriction, the pressure decreases to the vaporization pint of the fluid (which is cavitation). This condition causes heat and rapid oxidation to take place. 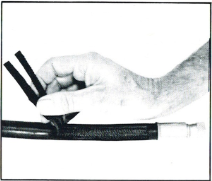 Heat and oxidation harden the tube of the hose downstream of the restriction. Symptom: Hose has not burst but it is leaking profusely. A bisection of the hose reveals that the tube has been washed away to the reinforcement. Cause: This failure would indicate that erosion of the tube has taken place. 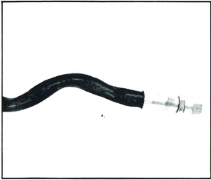 A high velocity needle-like fluid stream being emitted from an orifice and impinging at a single point on the hose tube will hydraulically remove a section of it. Be sure that the hose is not bent close to a port that is orificed. Where high velocities are encountered, contamination in the fluid can cause considerable erosion in bent sections of the hose assembly. This process would be similar to sandblasting. Symptom: The hose has pulled out of the hose fitting. The hose has been considerably stretched in length. This may not be a high pressure application. Cause: Insufficient support of the hose. It may be necessary to support long lengths of hose, especially if they are vertical. The weight of the hose, along with the weight of the fluid inside the hose, is being imposed on the hose fitting. This force can be transmitted to a wire rope or chain by clamping the hose to it, much like the utilities support bundles of wire from pole to pole. Be sure to leave sufficient slack in between clamps to make up for the possible 4% shortening that could take place when the hose is pressurized. Symptom: The hose has not burst, but it is leaking profusely. An examination of the bisected hose reveals that the tube has burst inwardly. Cause: This type of failure is commonly referred to as “tube blow down.” It may be associated with very low viscosity fluids such as air, nitrogen, Freon and other gases. What happens is that, under high pressure conditions, the gases will effuse into the pores of the tube, charging them up like miniature accumulators. If the pressure is suddenly reduced to zero, the entrapped gases literally explode out of the tube, often tearing holes in it. In some hose constructions, a second tube made form plastics, such as nylon, is used. Very high velocities in hydraulic systems may also cause “tube blow down.” Using a hose with a large inside diameter will usually solve this problem. Symptom: A Teflon hose assembly has collapsed or kinked internally in one or more places. Cause: One of the most common causes for this is improper handling of the Teflon assembly. Teflon is a thermoplastic material which is not rubber-like. When bent sharply, it simply collapses or kinks. This type of failure is localized in one area and is radial. 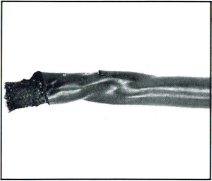 If the Teflon tube is folded longitudinally in one or more places, this could be the result of heat (which softens the tube) along with vacuum conditions. Because of additional tension of the wire braid reinforcement inherent with this type of hose, there is always a radial tension on the tube trying to push it in. Many manufacturers offer an internal support coil that will eliminate this problem. When the required bend radius is small, convoluted Teflon hose may be the answer. Symptom: Hose fittings keep blowing off of thermoplastic hose. Cause: Providing the right fitting for the hose has been selected and properly attached, the probable cause of failure is heat. While under compression, thermoplastic has a tendency to soften and flow out of the compression area when subjected to high temperatures. Symptom: A hose assembly with a Teflon tube has developed a pin hole leak or several pin hole leaks. Cause: This situation may occur when a petroleum base fluid, with a low viscosity, is flowing at a high velocity, which can generate high voltage static electricity. The high voltage is seeking a ground connection, and the stainless steel reinforcement is an excellent ground. This causes an electric arc, which penetrates through the Teflon tube as it travels to the reinforcement. Specially constructed Teflon tubes are available that have enough carbon black in them to be conductive. They will “drain off” the static electricity and preclude this problem. Rapid cycling from a fluid (steam) hot agent in the hose to a cold fluid (tap water) in the hose can produce a similar failure. Aeroquip Industrial Training and Development Center. How to Analyze Hose Failure. Maumee, OH: Aeroquip Industrial Training and Development Center, 1991. Print. The OEM level – The delivery of new units may be delayed because of fluid system leakage. The dealer level – Sales may be lost if oil drips from the unit onto the showroom floor. The user level – Leakage causes too much costly downtime. In this article you will find a condensation of more than 40 years of Aeroquip’s experience in working with the basic types of fitting configurations that contribute to piping system leakage. The causes of most leakage are identified and appropriate corrective measures are suggested. Wash down the leakage area. Watch for the leak to show. Place a paper towel above the connection; it will catch any fluid leaking from the above. Determine the leak is at a valve spool, rod packing, motor or pump shaft, cracked casting, piping joint or hose or tube. How it Works: This connection seals on the two mating 37° seats. Causes: Most of the leaks on this connection are due to lack of tightening or human error. You can’t tell if the nut has been tightened by just looking at the connection. If it is more than finger tight, you can’t tell from observation how much. Torque wrenches are good only when they are used. You must rely on the user to be sure torque wrenches are used on all joints. The user must depend on his memory to know if he has tightened all of the joints. Cure: Here are steps for an excellent method of tightening. Anyone can tell if the joint was tightened and how much. Tighten the nut by hand until it bottoms the seats. Using a marker, draw a line lengthwise on the nut and extend it onto the adapter. 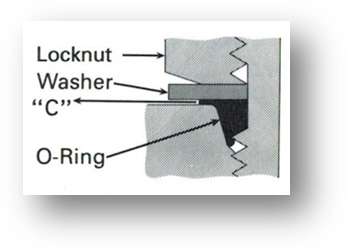 Using a wrench, rotate the nut to tighten. Turn the nut the amount shown in the chart below. How it Works: This connection seals with an O-Ring on the male against a chamber in the port. The use of straight thread O-Ring ports in place of pipe threads helps eliminate hydraulic leakage. The locknut and washer mush be to the top side of the thread relief. The washer must be snug to the thread relief. If not, reject the part. Lubricate the O-Ring – this is very important. Thread the male O-Ring half into the port until the washer or solid hex bottoms onto the machined surface. Note: Make sure the spot face is large enough to accommodate the washer or hex of the adapter. Position the elbow for desired alignment by backing it out of the port up to one full turn. Tighten the locknut or solid hex. 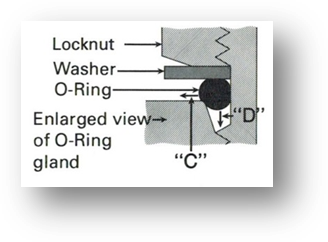 The locknut and washer cannot bottom fully if the O-Ring is between the washer and the face of the boss. The compressed rubber between the washer and the boss will cold flow out from compression and the fitting will be loose and usually leak. When the locknut and washer have not been backed up, there is not enough room for the O-Ring seal when the squeeze takes place. The washer can’t seat properly on the face of the boss. The compressed rubber between the washer and the boss face will cold flow out from compression, and the fitting will be loose and usually leak. 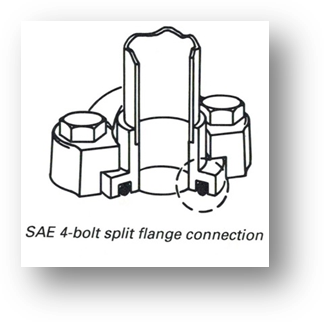 How it Works: The SAE 4-bolt split flange connection is a face seal. The flanged head which contains an O-Ring seal must fit squarely against the mating surface and be held there with even tension on all bolts. The flanged head protrudes past the split flange clamps by .010 to .030 inch. This is to ensure that the flanged head will make contact with the mating accessory surface, compressing the O-Ring to form the seal. Causes: This connection is sensitive to installation errors and bolt torqueing. Because of the flanged head protrusion and the flange clamp overhang, the flanges tend to tip up in a seesaw fashion when the bolts are tightened on one end. This pulls the opposite end of the flange away from the flanged head and, when hydraulic pressure is applied to the line, pushes the flanged head into a cocked position allowing seal extrusion. Cure: All bolts must be installed and torqued evenly. Finger tightening will help to get the flanges and shoulder started squarely. If lock washers are used, even more care must be taken. 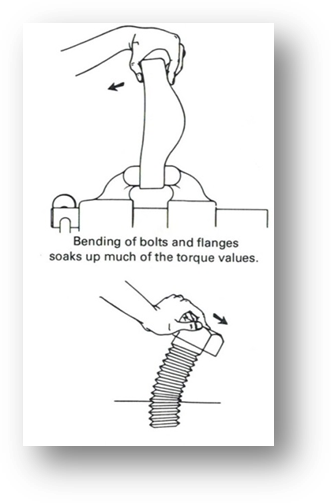 A Second Cause: When excessive torque is applied to the bolts, the flanges often bend down until the bottom on the accessory. This also causes the bolt to bend outward. 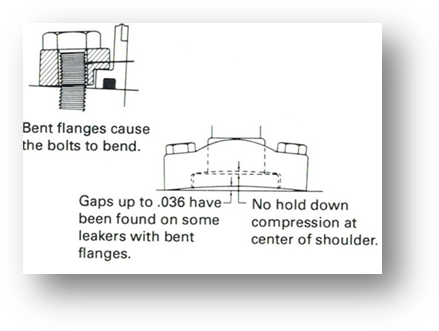 Bending of the flanges and bolts tend to lift the flange off the shoulder in the center area between the long spacing of the bolts. 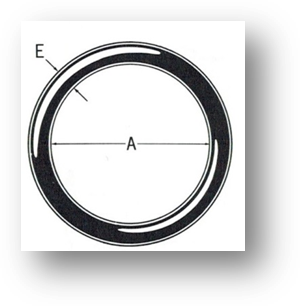 SAE J120 O-Ring Size No. Aeroquip ORS® fittings and adapters are flat faced O-Ring seal connections that provide an excellent solution for leakage problems. These connections meet SAE J1452 performance requirements and are designed to handle working pressures up to 6000 psi. In order for Aeroquip ORS connections to virtually eliminate piping leaks, care must be taken to avoid the following problems, which may cause leakage. Lack of proper tightening . . . . . . . . . . . Always use the following recommended torque values for maximum service life. No O-Ring in the groove . . . . . . . . . . . Make sure that the O-Ring does not fall out of the male end before the connection is made. Proper lubrications will help. Improper O-Ring Size . . . . . . . . . . . . . 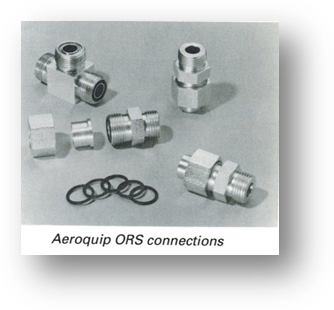 Although the Aeroquip ORS connector uses a standard size O-Ring, It is not the same size as those used on O-Ring boss or split flange fittings. It is critical that the correct O-Ring is used. The proper dash sizes and dimensions are listed on the chart below. For virtually all types of fluid connectors involving O-Rings, there are common guidelines that should always be followed. 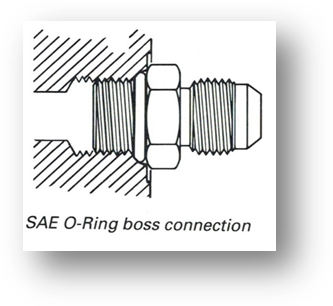 Care should be taken to ensure that the O-Ring is properly seated when the connection is made. For maximum service life, us only O-Rings that are made of materials recommended by Aeroquip for the application. Maximum temperature ratings must not be exceeded for long lasting leak-proof connections. O-Rings should be lubricated using a compatible high shear oil, such as Aeroquip Lube (Part Number 222070). Lubricate as necessary to prevent rolling or cutting upon connection. For EPR O-Rings, use a vegetable-base lubricant or the system fluid. Keep all connecting surfaces clean and grit free. Used O-Rings should be replaced before re-installation to help prevent leakage problems. NPT threads are likely to leak much more than Dryseal pipe threads. Either kind of pipe thread will leak if under tightened. There is not a general accepted standard for tightening either style of tapered threads. The tightening requirements change with each reuse and / or type of sealant used. Use a good pipe sealant on the male threads. When applying pipe sealant, do not put any on the first two threads. Over tightening may crack the female port. Aeroquip Corporation. How to Identify and Cure Piping Leaks; Training Bulletin JA14A. Maumee, OH: Aeroquip Corporation, 1990. Print. Check pump rotation. Direction of rotation must correspond with arrow on the pump case. Check fluid level. Surface fluid should be well above the end of the suction line during all of the work cycle. Check coupling alignment. Pump and motor should be aligned within .003 T.I.R. Check for restricted flow in the suction piping. Make sure all piping and fittings are full size throughout. Make sure suction line is not plugged. Avoid excessively long suction lines and elbows. Check for restrictions at filter or strainer. Calculate required size and double to allow for partial blocking by contaminates. Check for sticking vanes. Remove pump cover and check rotor and vanes for presence of chips, sticky oil or varnish deposits. Check pump speed. Speeds above maximum rating are harmful and cause premature failure. Check for air or air bubbles in intake line. Make sure reservoir has baffles and return lines terminate below fluid level on the opposite side of the baffle from the intake lines. Check operating pressure. Reduce pressure to minimum required for installation. Check to see if the pump is discharging through relief valve. Remove relief valve. Relief valves are not required with Continental vane pumps and they create additional heat. When using other pumps, relief valves must be used but set relief pressure 15% above pump pressure. Check to see if pump is unloading during idle periods of machine operating cycle. Use an open center valve or dual pressure governor when applicable on machine cycle. Check cooling system. Install cooler or increase reservoir capacity. Check for excessive pump slippage. Tighten bolts on the pump cover. Check case drain return location. Make sure the drain and suction lines are separated by a baffle in reservoir or that drain is located at a distance practical before fluid re-enters pump. Check progressively through the system components. Feel components to locate excessively hot ones and repair or replace them. Check for high ambient or radiant temperatures. Relocate power unit, baffle against heat, or use fan directed against reservoir to increase air flow across the reservoir. Check for abrasives on pump shaft. Protect shaft from abrasive dust and foreign materials. Check for damage at installation. Possible scratched or damaged seals. Replace seals, avoiding cuts when passing seals over key ways. Check for pressure in pump case. Inspect case drain for restrictions. Pipe should be full size direct to reservoir. Pressure should not exceed 10 psi. Check for fluid incompatibility. Fire resistant fluid may require special seals – convert seals. Check for chips or other foreign materials. Make sure clean fluid is used. Check for excessive shock loads. Observe maximum rating of operating pressure, reduce operating pressure. Check for overhung loads. Overhung loads are not recommended. Continental pumps are not designed to handle overhung loads. Make provisions for outboard bearings to alleviate condition. Check for high operating pressure. Reduce maximum pressure at no flow. Check for incorrect fluids. See data pages for proper fluid codes. Check for possible improper start-up. See proper pump start-up instructions. Check fluid level. Surface fluid should be well above the end of the suction line during all of work cycle. Check minimum pump speed recommendations. to be sure of proper priming characteristics. Check for improper pressure adjustment. Turn in pressure adjustment screw two or three turns after spring tension is felt. Check for air leaks in suction line. Tighten joints and eliminate any possible place for air to enter system. Check fluid viscosity. May be to heavy for proper priming. Check recommendations on pump data page. Check maximum volume control. Turn volume control counterclockwise to increase delivery. Check for a bleed off in another portion of the circuit. Look for open center valves or other controls connected directly to tank. Check for plugged suction lines. A periodic check should be made as a preventive maintenance procedure. Check for broken pump shaft or rotor. Check for signs of excessive shock, dirt, foreign material or other cause of failure. Check for sheared key at the coupling. Replace when required. Check maximum volume control. It may be screwed in too far; back out the maximum volume control. Check for dirt or chips under the vanes holding the pressure ring on center. Dismantle pump, inspect, and clean up dirt and chips. Check if pump is delivering fluid. See section "pump not delivering fluid. Check pressure adjustment screw setting. Adjust pressure screw to obtain desired operating pressure at deadhead. Check to see if pressure is being relieved through a bypass valve. Remove relief valve, or set cracking pressure at least 200 psi above pump pressure valve. Check to see if fluid is bypassing to reservoir. Test the circuit pressure, progressively watching for open center valves and/or other valves open to reservoir. Check to se if pressure gauge line is shut off. Check to se if gauge snubber is open. Install a pressure gauge known to be accurate in a line open to direct pump pressure. Check to see if system requires more fluid than pump capacity. Check the pressure at deadhead. Check for malfunctioning or broken gauge. Install a new gauge. Check to see if motor is properly sized for pressure and volume requirements. Review engineering data pages for proper horsepower recommendations. Check to see if there is excessive internal slippage in the pump. Tighten the cover bolts on the pump. Check to see if pump is being started with full pressure and volume. Use a higher starting torque motor or start pump with vale closed so no fluid will flow. Check to see if motor overload protection is undersized. Install a larger capacity unit with a larger heater. Check for low voltage. Check the voltage input and/or increase to larger wire leads. Check the motor wiring for the wrong voltage. Check motor leads for proper voltage connections. Check for internal pump seizure. Repair or replace pump. Check for dirt in the system. Drain and flush system. Disassemble and clean if necessary. Check for restricted drain. Check fittings or drain lines. Check for low pilot pressure. Check for pilot pressure system if applicable. Check for malfunctions of solenoids. Check for proper source and voltage. Check for distortion of the valve body. Check flatness of mounting surface. Align the valve body and piping to remove strain. Loosen mounting bolts. Check flow rate through valve. Must be within valve flow limits. Check for dirt in the system. Disassemble, clean and flush. Check for blocked drain. Inspect for plugs or foreign matter. Check to see if the pilot pressure is off. Check the source of pilot pressure. Check to see if solenoids are inoperative. Check the electrical source and solenoid coils. Check distortion of the valve body. Check flatness of mounting surface. Align the valve body and piping to remove strain. Loosen mounting bolts. Check for improper reassembly after repair. Use master parts page and repair pages for proper assembly, parts and procedures. Check for improper installation connections. Check the installation drawings. Check for improper assembly of valves. Check master parts pages and installation drawings. Check flow rate through valve. 1.2.1 Clamping Plunger - A device that applies clamping force to the workpiece. 1.2.2 Workpiece - The part or material that is to be held in place. 1.2.3 Pressure Piston - A device used to apply pressure to a hydraulic medium. The hydraulic clamping process consists of properly applying the forces created by a hydraulic clamping system to secure a workpiece. A hydraulic clamping system consists of the components illustrated in Figure 1, which shows the basic arrangement and operating principle of the use of hydraulic media. Any such process using hydraulic fluids for clamping purposes may be referred to as a hydraulic clamping system. The operating pressure provided by hydraulic fluids in clamping systems can reach a maximum of 5000 psi (350 bar), allowing the application of considerable clamping forces even when using compact clamping cylinders. When properly designed and controlled, the hydraulic clamping mechanism will prevent the workpiece from moving (sliding, twisting, etc.) when machining or other forces are applied, yet will not cause an unexpected permanent distortion to occur in the workpiece. 2.1.1 Locating a Body - The term “locating” refers to the process of positioning the workpiece inside the clamping device, and holding it in position for the necessary machining. Only workpieces that are correctly held can be consistently machined within specified tolerances. 2.1.2 Limiting the degrees of freedom - The process of locating and holding a workpiece may be referred to as “limiting the degrees of freedom.” Any motion of a workpiece in any possible direction is considered to represent one degree of freedom. A three-dimensional workpiece therefore possesses six degrees of freedom, as shown in Figure 2. These six degrees of freedom consist of the translational motions “T” in x, y, and z direction, and the rotational motions “R” turning about the x, y, and z axes. The degrees of freedom that a given workpiece or body possesses may be reduced by introducing reference planes that pass through any two axes. For example, the plane in Figure 3a limits movement to travel in x and z directions and rotation about the y-axis. By defining this fixed plane, the workpiece can thus be limited or constrained to three degrees of freedom. Another two degrees of freedom may be constrained by introducing a second reference plane, as shown in Figure 3b. This reference plane limits movement to translational motion in the x direction. Constraining the last degree of freedom can be accomplished by defining a third reference plane as shown in Figure 3c. 2.1.3 Locating a workpiece - The process of locating and holding a necessarily require the elimination of movement in all six degrees of freedom, the following three locating techniques are used in actual practice. Figure 4a: Semi-constrained Workpiece. The workpiece is held in one plane only (elimination of three degrees of freedom). Figure 4b: Constrained Workpiece. The workpiece is held by two planes (elimination of five degrees of freedom). Figure 4c: Fully-constrained Workpiece. The workpiece is held by three planes (elimination of six degrees of freedom). Correctly located workpiece - Over-location of the workpiece occurs when there is more than one locating plane or point for any given degree of freedom. To prevent bending the b-c rib while machining the piece, a third reference plane (3) is introduced. Placing a workpiece (6) inside the clamping device (4) causes over- location. Since the distance between the locating planes (1) and (3) is constant in this device, the dimension c differs between individual workpieces. This over-location therefore gives rise to machining error. Figure 5c: Shows how to locate a workpiece correctly. 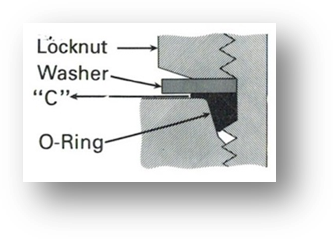 To avoid tilting the workpiece, the torque “M” transferred from the workpiece (5) to the body to be machined (6) must be balanced by an appropriate counter-torque. This counter-torque is created by the clamping force “F.” Over-location may also occur if a workpiece (Figure 5) is limited by too many locating points. The introduction of more than three locating points along the bearing surface, or more than two points in the guide plane, or more than one point in the supporting plane may lead to undesirable workpiece motion, and thus adversely affect the precision of the resulting product. Any additional support points must be adjustable. If the workpiece to be machined must be supported to avoid deflection, then all other bearing points must be defined as variables and must be determined in relationship to the workpiece being machined. The location process is subject to a number of design guidelines, but exceptions are possible. Always arrange the location points according to the pre-machined condition of the workpiece. Previously machined points have priority as desirable locating points. The locating points on the locating plane should be as far away from each other as possible. Arrange the clamping points such that the defined position is retained during clamping. The locating points should be in line with the clamping points to shorten the force vectors inside the workpiece. Three, two, or even one clamping point may be used to clamp a workpiece against the locating plane. Precision surfaces should not be held on a continuous surface, so that an “infinite” number of contact points can be avoided. Keep the clamping force vector away from the critical tolerance zones on the workpiece. Workpiece deformation and marking due to clamping forces should be avoided or minimized. The clamping points on the workpiece should be selected so that the piece can be machined without reclamping or, if this is not feasible, with a minimum of reclamping. The required clamping forces should be approximated by rough estimations. The clamping dimensions of the workpiece may change due to thermal expansion and vibration resulting from machining. 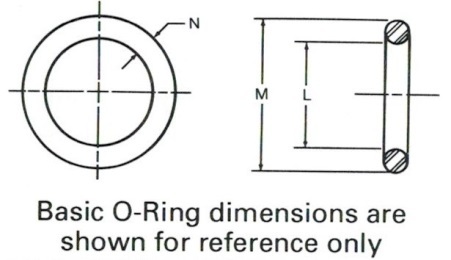 The workpiece should only be exposed to a clamping force if it is appropriately supported by a solid bearing point, as illustrated in Figure 6. The dimensions of clamped workpieces may change due to vibrations and the effects of thermal expansion. Two types of clamping may compensate for these changes. Mechanical clamping elements are usually used for simple clamping devices. However, mechanical clamping elements may be converted to hydraulic ones by inserting cylinders between the clamping element and the workpiece. In addition, mechanical elements may also be combined with hydraulic clamping elements. Clamping may be subject to errors that cause deformation of the clamped workpiece. Since such deformations must not affect the function of the workpiece, all conceivable locating and supporting techniques, as well as the best possible directed transmission of the clamping force through the workpiece, should be considered. It is recommended that clamping forces be estimated to prevent excessively high clamping forces and possible deformation of the workpiece. Deformation of the workpiece may also be avoided by selecting a suitable shape (for example, a sphere) for the clamping points and the locating points. 4.1 Supported workpiece - The workpiece requires support to ensure functional force transmission between the tool, the workpiece, and the clamping device, and/or to protect the workpiece from deformation (such as deflection at points with a thin cross-section) due to machining forces, gravitational forces, and clamping forces. Workpiece support also acts to eliminate the resulting machining errors (Figure 9). In addition, surface quality may be improved and the service life of the tool prolonged with the use of an optimum supporting mechanism. The three-dimensional position of a workpiece, however, should not be defined by its support. It is preceded sequentially by the locating process and also has a lower priority. A workpiece is considered to be supported even if it must be supported by frequently mobile and variable elements surpassing the theoretical maximum number of locating points. An example of this would be an unstable workpiece that easily vibrates. When a deformed workpiece must be held and clamped in all three planes without altering its shape, it is possible to use a technique involving self adjusting spherical surfaces. In this case the bearing surfaces, the close tolerance bolts, the limit stops, and the vertically adjustable supporting and clamping elements must be equipped with spherical surfaces. The illustrations in Figure 10 illustrate two different clamping methods. It shows deformation of a workpiece caused by conventional clamping (Figure 10a). As a result of this deformation, the surface area of the workpiece exhibits a greater degree of deformation when unclamped. This deformation, which is convex in shape, may be attributed to the fact that the workpiece assumes its original, deformed shape (c), as soon as the clamping pressure is released. The clamping points illustrated in Figure 10b are spherically shaped, and can therefore largely adapt to the workpiece curvatures (b). The machined surface is therefore flat, and the workpiece is only exposed to possible internal stresses that may be released by machining. 4.3 Determination of the clamping force - It is important to ensure that a workpiece that is clamped inside a device is not moved from its position by the clamping force and the subsequent action of the cutting force. This risk of movement may be minimized by applying the clamping force to the solid bearing surfaces of the device (Figure 11). This introduction will help you use information provided by tool manufacturers in the application of their tools. Estimating cutting forces being transferred into the workpiece is just one tool to use in a competitive workholding environment. The information presented here is only to be a guideline and not the final decision. Use this information with a cutting tool brochure you get from your cutting tool supplier as an aid in determining your cutting forces. Much of the calculations presented here are readily available from many sources. Your cutting supplier may even have a slide chart you can obtain to do equations for you. The operations described here include boring, drilling, end milling and face milling. Drilling involves using a multi-fluted tool with a helix spiral. The tool is driven in as it is rotated to create a round hole. End Milling uses a multi-fluted rotary tool with or without removable (inserts) teeth to remove material along the edge of the workpiece. The cut is usually very shallow and the depth is many times the thickness of the cut. Face Milling involves a very shallow depth, but a very wide cut. Cutters can range up 12 inches (300 mm) or more in diameter and can have many replaceable teeth (inserts). These examples are only a very small sample of operations that can use hydraulic workholding. 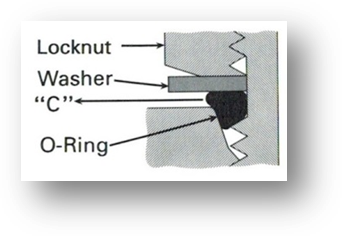 These cutting force examples involve face milling. The largest use of hydraulic workholding is by far for some sort of milling operations. Example An 8-inch diameter cutter with 10 teeth (inserts) is machining low silicon aluminum at 3000 SFM (surface feet per minute). First, you must convert surface feet/ minute into tool RPM/Solving Tool RPM= SFM Diameter (Inch) x .2618 = 1432 Tool RPM Now you can determine your material removal rate. An independent tool catalog lists a feed per tooth of 0.008" maximum at 3000 SFM at cut depth of 0.1". This gives 8" (diameter cutter) x 0.100" (cut depth) x 0.008" (feed per tooth) x 10 (number of teeth) x 1432 (spindle RPM)= 91.6 cubic inches per minute material removal rate. Next, spindle horsepower is found using unit HP from the table Spindle Horsepower = 91.6 x 0.4 (Unit Horsepower for Aluminum with a dull tool) = 36.6 HP. Note this Horsepower is for fixture design and not for machine tool horsepower requirements. For example a true 40 HP machine can remove aluminum well over 200 cubic inches per minute. Using the original formula: 36.6 hp x 26,400/3000 SFM = 322 lbs. 3000 SFM of force being transmitted into the work. Force is transmitted in the same direction as the cutter movement. In other words, if the cutter moves right to left in the diagram below, the cutter force is transmitted from right to left. Using a safety factor of 2 for rigid clamping gives 644 pounds in line parallel to the line force and 483 pounds using an elastic medium such as hydraulics with a safety factor of 1.5. Note this force does not take into account any sort of friction factors if you plan on relying on friction force between a swing cylinder and the workpiece. The coefficient of friction for lubricated aluminum is .12 (flooded with coolant) this same 483 pounds of force becomes 483/.12 = 4025 pounds. This uses clamp force only and does not take into account any direct forces that may be developed by the cylinders that located the workpiece against fixed locators. Cutting Force (Newtons) = Spindle Power (kW) x 48000 (80% efficiency) / Cutting Speed (Meters per minute). Spindle Power = Unit Power (kilowatts per cubic centimeters of material remove per minute) x Material removal rate (cubic centimeters per minute). Material removal rate (Cubic centimeters per minute) = Width of cut (mm) x depth of cut (mm) x feed per tooth (mm) x number of teeth x spindle RPM/1000. Example: A 200 mm cutter with 10 teeth is machining low silicon aluminum at 1000 MPM (meters per minute). Solving Tool RPM = MPM x 1000 Diameter (mm) x p (= 1592 Tool RPM) The same tool catalog lists a feed per tooth of 0.2 mm at 1000 MPM and a cutting depth of 2.5 mm. This gives an 200 mm cutter x 2.5 mm depth x 0.2 mm feed x 10 teeth x 1592 Tool RPM/1000 = 1592 cm3/min. This too is power from a fixture design standpoint; the actual operation will use less power than indicated here. Using the original formula transposed is: Cutting Force 1378 (Newtons) = 28.7 (kW) x 48000 (80% efficiency) / 1000 (MPM cutting speed). Multiply by a safety factor of 2 for rigid clamping and by 1.5 for elastic clamping (hydraulic). This calculation does not take into account coefficients of friction when using clamp cylinders. For example, if the aluminum has a coefficient of .12 (flooded with coolant), the clamping force becomes 1378/.12 = 11483 Newtons of force. This calculation does not take into account forces being generated by the fixture positioning cylinders. Use these numbers and set up your hydraulic system to run at about 50 to 75% of its rated pressure. This leaves some reserve for a later date when the process is optimized and you need more holding/ clamp force for higher speeds and feeds. If you design to the maximum now, you have nothing in reserve. This is the most important consideration when installing the cylinder. When cylinders are shipped, the ports are usually securely plugged with plastic plugs which should not be removed until the piping is to be installed. All piping should be thoroughly clean, to include the removal of all threading and flaring burrs or chips, before making the connection to the cylinder ports. One chip can cause premature failure of the cylinder or other system components. When changing piston seals, extend the piston rod 3” or more if possible, being sure to support the piston rod and the piston at all times. *Remove the tie-rod nuts, blind end cap, the barrel and the piston seals. A light grease, compatible with the system fluid, grease, compatible with the system fluid, should be used on the rings and u-cup seals for smooth assembly. Install the u-cup piston seals, scarf cutting on only the back-up washers. Then install the cast iron rings with the joints in opposite directions. To reassemble start the piston into the tube, compressing the cast iron rings using twine or a ring compressor. When the piston u-cup seal is to the edge of the barrel, use a thing rounded blade to start the lip of the u-cup, making sure the entire lip is started before moving the piston further into the tube. When replacing barrel seals, use the same method of disassembling the cylinder as used when replacing piston seals. The barrel seal is a gasket which is layed into the end cap tube groove first. Then position the end caps squarely on the tube (check to make sure port location is correct), and firmly force or tap the end cap over the tube until it bottoms. Check to make sure the gasket did not move and then finish assembling the cylinder. External leakage: If leaking occurs between the end cap and barrel, check tie-rod torque. Do not over torque. If the torque is correct, then replace the barrel seal. When leakage occurs in the rod busing area, replace the rod seals. If leakage continues or reoccurs in short period of operation, check head end cap, cap end cap, and rod bushing. Pressure in a confined body of fluid acts equally in all directions, and always at right angles to the containing surfaces. The absolute pressure of a confined body of gas varies inversely as its volume, provided its temperature remains constant. If the temperature of a gas is raised, its volume increases by the same ratio, providing the pressure remains constant. Initial Pressure: The higher the pressure, the higher the flow. Size of Orifice: The larger the orifice, the greater the flow. Shape of Orifice: A circular passage has less surface area than an equivalent slot-shaped passage, thus less internal resistance is created, allowing greater flow. Pressure Differential: (Delta P) Pressure differential must exist for air flow. The greater the flow until terminal velocity is reached. There are more than 860 million dirt particles for every cubic foot of atmospheric air. To ensure longer system life and durability. Regulators reduce air consumption and lower total cost of ownership. Excess water in pneumatic lines and equipment damages components and reduces useful life. Dirty air will damage components. Pneumatic devices require consistent line pressure. The purpose of a particulate filter is to remove moisture and contaminants from compressed air. The air entering the filter is passed through a whirl disc that creates high centrifugal force with minimal pressure drop. The whirling action forces liquids and solids against the inside of the bowl where gravity pulls them to the quiet zone below the baffle where they can be drained out. The air then flows through the element where smaller particles are removed and the dry, filtered air passes downstream. The purpose of a coalescing filter is to provide a very fine degree of filtration, removing moisture, oil, and particulate matter as small as .01 micron. The air flows from the inside to the outside of the element through progressively larger media. As contamination moves through the element, solid particles are trapped and liquids are formed into large droplets. As the air exits the element surface, tension holds the liquids and allows them to drain to the bottom of the bowl. The purpose is to reduce the higher pressure provided by a plant’s air compressor to a lower, more suitable level for each machine in which the air is used. A regulators is a three way, normally closed, poppet valve which is closed by excessive pressure on its diagram. The purpose of a lubricator is to introduce an oil mist into compressed air to lubricate downstream equipment. Oil is introduced into the air via a venturi valve and is broken into a fine mist by high velocity air flow. The purpose of the integral filter regulators is to provide the benefits of a pneumatic filter and regulator in one device. Its' functionality is indentical to the mechanics of individual air prep units. Absolute Pressure: The sum of atmospheric pressure and gauge pressure. Designated as psia (pounds per square inch absolute). Atmosphere/bar: 1 atmosphere or bar equals 14.7 PSI at sea level. Air Receiver: A container in which air is stored under pressure as a source of pneumatic power. Ambient Temperature: The temperature of the immediate environment. Closed Center: Pertains to three-position valves; all ports are closed when the valve is in the center position. Detent: A device for retaining movable parts in one of more fixed positions; usually a spring-loaded device fitting into a depression. Positions of parts are changed by exerting sufficient force to overcome the detent spring, or by releasing the detent. Directional Control Valve: A valve whose function is to direct or prevent flow through selected passages. Flow Rate: The volume or weight of a fluid passing through a conductor per unit of time. For pneumatic systems, flow rate is most often expressed as standard cubic feet per minute (scfm). Fluid: A liquid or gas. Force/Thrust: A push or pull measured in pounds related to the power capability of an actuator. Four-Way Valve: Now designated as a 4/2 valve; a four-port, two-position valve. Media: The fluids used in a fluid power system. In a pneumatic system they are gasses such as air, nitrogen, or various inert gasses. Media Temperature: The temperature of the fluid within a valve of other device. Micron: A measurement equal to one-millionth of a meter or about 0.00004 inch. Normally Closed: A term used to describe a valve which blocks the flow of supply air when the valve is not actuated. Normally Open: A term used to describe a valve which allows supply air to flow only when the valve is not actuated. Open Center: Pertains to three-position valves; outlet ports are connected to exhaust when valve is in the center position. Pressure: A measure of force per unit area; often expressed as pounds per square inch (psi) or bar. Pressure Range: The range of inlet pressures with which a device can operate satisfactorily. P.S.I.A. : Absolute presents measured in Pounds Per Square Inch Absolute. This is gage pressure (PSIG) plus 1 atmosphere (14.7 PSI). P.S.I.G. : Positive pressure as registered on a gage, measured in pounds per square inch. S.C.F. : Standard cubic foot measurement of free air at 14.7 PSIA and ambient conditions. S.C.F.M. : A statement of S.C.F./minute used to express the air delivery or displacement of a compressor or the air consumption of a device. Signal: A fluid of electric command to the valve actuator causing the valve to change position. Silencer: A device used to reduce the sound level produced by an exhausting gas. Standard Air: Air at a temperature of 68 F, a pressure of 14.69 pounds per square inch absolute (psia), and a relative humidity of 36 per cent (0.0750 pounds per cubic foot). In gas industries the temperature of standard air is usually specified as 60 degrees Fahrenheit. Three-Way Valve: Now designated as a 3/2 valve; a two-port, two-position valve. Also known as a straightway valve. Torque: A rotary or twisting force measured in in/lbs or ft/lbs. Related to the power capability of an air motor or rotary actuator. Vacuum: Pressure less than atmospheric pressure, measured in inches of mercury (in Hg). Column of 29.92 in Hg = 0 PSIA. Volume: A measurement of space in a container. Stated in cubic inches ( in3) or cubic feet (ft3).